It’s the near future, and scientists have developed implants that treat brain dysfunction, and also make recipients capable of superhuman feats. Exploiting societal fears of the newly enhanced, politicians pass a set of laws to restrict the rights of 'amplified' humans, instantly creating a new persecuted underclass known as 'amps.' On the day that the Supreme Court passes the first of these laws, twenty nine year old schoolteacher Owen Gray is forced into hiding, only dimly aware of the latent powers he possesses. To escape imprisonment, and to find out who he really is, Owen seeks out a community in Oklahoma where, it is rumored, a group of the most enhanced amps may be about to change the world, or destroy it. It should have been the ultimate scientific marvel, a cognitive implant to cure the disadvantaged, the terminal and diseased. A small chip embedded on the temple led the way for a government initiative, but they didn't stop at curing seizures such as Owen's epilepsy, they developed an implant that would create a faster, more agile and intelligent human. The United States is on the brink of a civil war. What started with a suicide of a student for teacher Owen Gray, now he's running for his own survival. Pure Human groups have sought a court ruling to legalise discrimination against the Amp community. Those baring the temple ports are evicted from their homes, refused work and are chased into hiding. The streets are filled with the chants of Pure Pride, spurred on by the founder of the Pure Human Citizen's Council, senator Joseph Vaughn. Vaughn is a self imposed advocate of the unaltered humans, fighting against the Federal Uplift Program which continues to create a new generation of altered children. That the doctors are stealing away humanity, and he plans to oust the Amps so the community of Pure Human's can thrive. But Owen's implant isn't just to cure the epilepsy he developed as a teen, his father being the surgeon who embedded the implant had given Owen stolen hardware to counteract the damage his brain suffered as a result of his seizure. Owen is already on the governments radar, under the guise of being responsible for the death of his student, and they'll stop at nothing to bring Owen in. Out of options, Owen finds himself at Eden, a trailer park in Oklahoma in which he can seek solace with his own kind, a community of fellow Amps. Seeking answers, Owen is found by Lyle Crosby, a lanky cowboy that even the Pures seem to be afraid of. Lyle knows what Owen is and in exchange for Owen's help, Lyle is willing to teach him how to activate his implant. But Lyle isn't someone Owen wants to associate with, he's violent and the self imposed leader of an Amp revolution. Can Lyle be trusted? Owen is about to find out. With the civil war stepping up a notch and the likelihood of thousands dead, can Owen activate his implant before it's too late? Amped was really surprising and not my usual favoured read, but the synopsis was too intriguing to resist. My first Daniel H. Wilson novel was an experience, and I thoroughly enjoyed every moment. 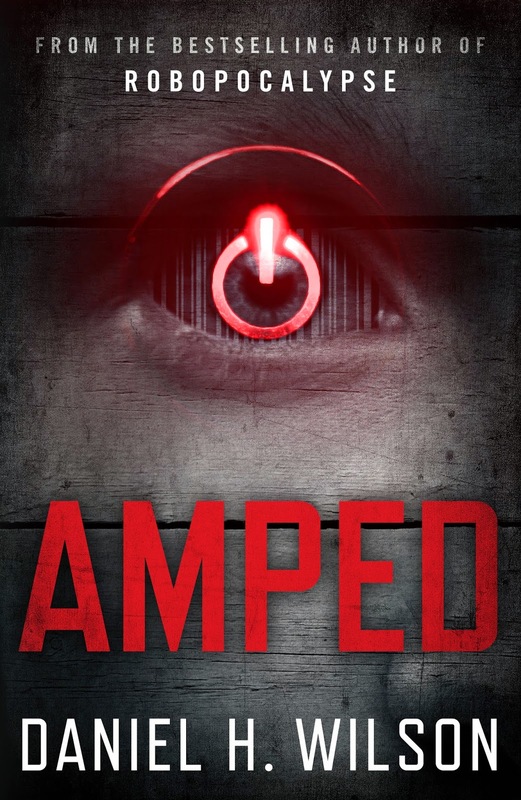 Essentially, Amped is a science fiction thriller, a touch of romance, but far to fleeting to mention. Perfect for the mature young adult reader, due to Owen being just shy of thirty years old. Society is crumbling, once a celebrated invention, now those with the Amp implants are hunted and there is no biding laws to protect them. Religious groups and Pure Pride advocates want them expelled from society, believing those with the fitted devices are taking their jobs, homes and lives, as their children suffer in the shadow of fellow students who are smarter, faster and bounds ahead. It's legal vigilantism at it's worse, Amps are less than nothing in the eyes of the new America that is on the horizon. Fight, and the Amp population will only justify the violence against them, do nothing and they run the risk of being killed, and Owen is torn between the two. I enjoyed Daniel H. Wilson's style of writing. It's to the point, unemotional and allows the reader to form their own opinions, being far removed from my usual young adult reads. I would have liked to see the characters more animated and developed. Although Owen was the main character, it was Nick who stole the show. Nick is a child who lives within Eden, intelligent beyond his years. He and Owen form a friendship, but Nick has it tough. His implant due to being blind, his parents wanting their child to thrive, only to abandon him. My heart bled for him and a few of the scenes involving Nick are truly heartbreaking. Regardless, I really enjoyed Amped, and looking forward to checking out Daniel H. Wilson's other releases.